HA note: The following is reprinted with permission from Libby Anne’s blog Love Joy Feminism. It was originally published on Patheos on June 2, 2014. What you may not be aware of is that in 1985 Mary Pride published a book titled The Child Abuse Industry: Outrageous Facts About Child Abuse & Everyday Rebellions Against a System that Threatens Every North American Family. Who is Mary Pride? If you’ve ever homeschooled, you’ve almost certainly heard of her. She has had so much influence in homeschooling circles that has been dubbed “the queen of the homeschool movement.” Historian Milton Gaither has dubbed Pride as one of homeschooling’s two most influential curriculum reviewers. Pride first published her Big Book of Home Learning in 1986 and has updated it regularly since. It now has four volumes. Pride is also the publisher of the “wildly popular” Practical Homeschooling magazine, with as many as 100,000 subscribers, and has published numerous other popular homeschooling how-to books. Pride is also the author of The Way Home, published in 1985 and credited with launching the Quiverfull movement (not to be confused with the Patriarchy movement). And then, of course, there is The Child Abuse Industry. According to R.L. Stollar, the book is “a remarkable read that calls for a ‘Second North American Revolution’ — namely, having babies, abolishing no-fault divorce, going to church, eliminating foster care, homeschooling, re-instituting “biblical” executions of criminals, and getting rid of abuse hotlines.” Stollar is currently writing a multi-part review, which I will definitely promote when it comes out. My interest piqued by Stollar’s quotes, I cracked open my copy of HSLDA’s Chris Klicka’s 2006 book, Homeschool Heroes: The Struggle and Triumph of Homeschooling in America. I opened to the chapter on social workers.
. . . Homeschoolers are at risk. They are not at risk because they have big families or teach their children at home or neglect their children in any way. They are at risk because the child welfare system has lost control. Many social workers are trained in a philosophy that is antiparent, antifamily, and antireligious. I can’t say I’m surprised, but here it is again. Look, I know that social services isn’t perfect, and that it’s badly in need of better funding. But that’s not what this sounds like it is about. According to Klicka, the issue isn’t that social services is underfunded and understaffed, but rather that social services is antifamily. This is the same sort of line Mary Pride was promoting in her book. HSLDA’s mission is primarily to advance homeschooling rights. Sometimes homeschooling parents get reported to CPS because people misunderstand homeschooling. They may see children playing outside during school hours and think that the parents are allowing them to be truant. Other times, families are reported for other types of suspected abuse or neglect. Investigations of all such allegations begin the same way: a social worker visits the family’s home, or contacts them requesting to set up a visit. HSLDA advises our members in these initial contacts with social workers in order to ensure that their constitutional rights are protected. Once the allegations are revealed, we continue to represent our members if the allegations relate to homeschooling. In other words, according to HSLDA’s website, they advise member families any time there is a social worker at the door, but only represent member families going forward if the allegations involve homeschooling. Along these same lines, an announcement on HSLDA’s facebook page last year asserted that “HSLDA does not and will not ever condone nor defend child abuse.” But some of the stories Klicka relates from his years working for HSLDA tell a different story. A homeschool father in Michigan picked up his two-year-old child by the arms, taking her into the house while she was crying and was reported for child abuse by a nosy neighbor. I set up a meeting with the social worker and counseled the family on what htey should say. I told themI told them to explain their religious convictions concerning raising their children from “a positive standpoint” avoiding Bible verses like if “you beat him with the rod, he will not die.” Or, if you “beat him with the rod,” you will “deliver his soul” from hell. Not a good idea. Social workers just don’t understand those verses. Instead I told them to explain their beliefs by emphasizing verses such as Matthew 18:6 that states that if you harm or offend a child, it is better that a millstone be tied around your neck and you be thrown in the deepest part of the ocean. In other words, their religious convictions demand that they not do anything that will harm their children. When the family began presenting these religious beliefs to the agent, he became visibly uncomfortable, and suddenly announced that he would close the case. In Fairfax County, Virginia, a pastor gave a seminar on child discipline that included the requirement in the Bible to spank. A parishioner had to discipline her child while a neighbor was visiting a few days later. She spanked the child in the other room and then explained to the neighbor a little of what she had learned from the pastor. To clarify, this suggests the pastor spoke in his sermon of bruising his children and carrying out twenty-minute spanking sessions. The social worker who then initiated the investigation told me she thought she might have a religious cult on her hands that abuses children. I expressed my disbelief to the social worker that she was seriously investigating what an anonymous source claimed she heard from a person who heard it from another person. That is thrice removed hearsay. I told her that her evidence was flimsy and set the parameters for a meeting. In preparation for the meeting, I told the homeschooling pastor and his wife not to recount any specific incidents of spanking since the social worker had nothing on the family that would stand up in court. I told them that they should emphasize again the positive verses such as Matthew 18:6. Since the social worker had no evidence, the only evidence she could acquire would be from what information she could gather from the pastor and his wife. Since the parents carefully avoided all specific examples and spoke in general terms, the social worker had nothing and had to close the case. Perhaps those at HSLDA would argue that they never defended someone against child abuse in court. But in this layman’s eyes, this constitutes defending child abuse. I mean, did they even ask the pastor if it was true that he bruised his children and spanked them in twenty-minute sessions? Or did they de facto believe he was innocent and not bother checking, as seems to be their habit? I’ve expressed my frustration with this before. We have had numerous situations where doctors turned homeschoolers in to social workers because they found a bruise or mark on the child . . . I learned early on that each family needs to know their doctor well. If the doctor is familiar with the patients and trusts them, they do not have to turn them over to a child welfare agency, even if they have a mark or bruise. It is completely the doctor’s discretion. The orientation toward social services is the same in Klicka’s book as in Pride’s—one of opposition. They are the enemy. In fact, Klicka began his chapter on social workers with I Peter 5:8-9—”Be sober; be vigilant; for your adversary the devil walks about like a roaring lion, seeking whom he may devour.” The assumptions about the veracity of the parents’ and children’s testimony is the same—parents’ word can be trusted, children’s cannot. We need to be careful not to assume that all homeschoolers engage in this sort of denialism and defense of child abuse. I do not know whether the themes explored here extend beyond the leaders of the conservative Christian homeschooling subculture, and we should not assume that we do. But with that subculture, this is a problem. With these sorts of narratives, how can we expect those within this subculture to even self-police, much less report suspicions of abuse? 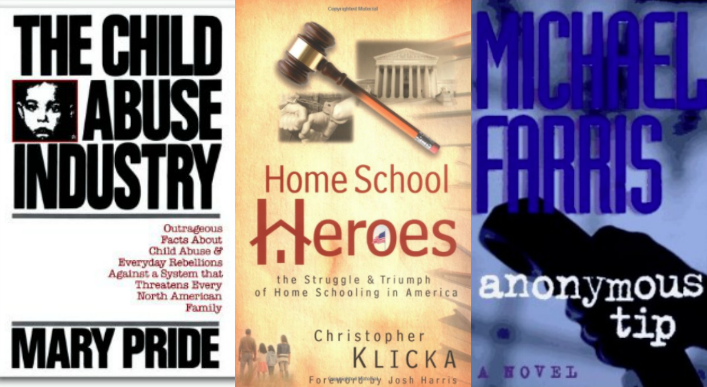 From Pride’s The Child Abuse Industry to Michael Farris’s thrill-horror novel Anonymous Tip, this is a problem. Oh, and also? If there are Christian homeschoolers out there who are upset by what I’ve said here, the correct response is to go about condemning the words of these Christian homeschool leaders and creating a new narrative, a narrative that affirms reporting suspicions of child abuse and doesn’t de facto trust parents’ word over that of their children. Condemning me for saying these things or arguing that I am anti-homeschooling would be the incorrect response. “I mean, did they even ask the pastor if it was true that he bruised his children and spanked them in twenty-minute sessions? Or did they de facto believe he was innocent and not bother checking, as seems to be their habit?” If only that were the case. Undoubtedly they believe that he has every right to bruise his children and to spank them in 20-minute sessions, hence it’s a non-issue to them.